Anyway, since its our last day in this beautiful city, we decided to make the best of it to start real early so that we can go more places, do more things and most importantly, eat more food!!! 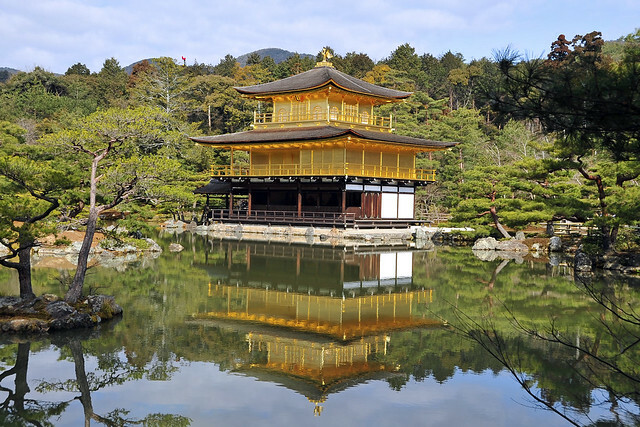 The original itinerary was to take the train down to Kyoto Station and change to one of those tourist circuit buses which would bring us to northern Kyoto. But our day in eastern Kyoto, i.e. Higashiyama told us otherwise. tourist buses are often jammed pack with, well… tourists! Not the most comfortable of all rides to be on. Moreover, we stayed just next to Nijo-jo, which basically placed us right in the middle of the map of Kyoto! So, having to travel down to Kyoto Station and then all the way back up again sounded all too counter-intuitive. Two days in Kyoto had really made us bolder when it came to taking buses. We took impromptu and totally unplanned bus rides from Arashiyama to Gion on the first day, from Hei’an Jingu to downtown Kawaramachi, and then from Kawaramachi dori back to the hotel on the second day. Not bad eh… we thought. Not only did we save money since subway rides in Japan are so freaking expensive, more importantly, we saved time. And we are in luck! A quick check with the bus stop directory outside the hotel quickly led us to know that there is actually one bus which would bring us right from where we stayed directly to the gates of Kinkakuji! What a great way to start the day! 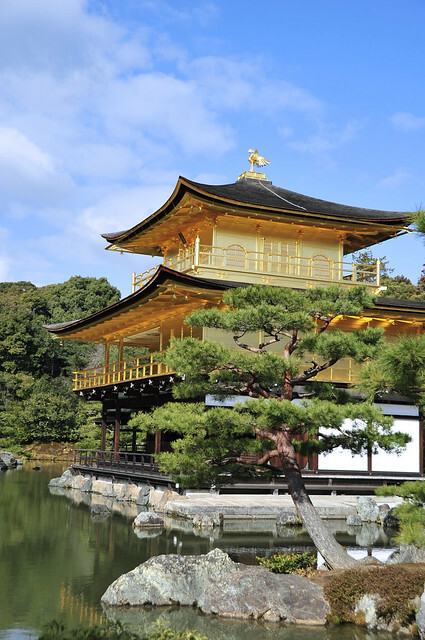 Kinkakuji 金閣寺 is a UNESCO gazetted site and probably one of the most photographed sites of Japan, making very regular appearances on postcards and souvenirs. From the gateway to the main sight, we had to walk a long, dark and gloomy gravel road, not unlike the one at Meiji Jingu in Tokyo. So when we first caught glimpses of the brilliant iridiscence of shimmering golden walls catching the glorious rays of the recently risen sun, we were totally blown away and couldn’t help but let out a soft “wow”, in awe and admiration as we basked in her beauty that was set right before us. And we weren’t the only ones spellbound. Hoards of tourists who came pouring in behind us responded in similar ways, merely differing in levels of subtley or drama. We stood by the main pavillion for a good 15-20 min snapping as many shots as possible from various angles but had to move on as more tourists began to pour in by the truckloads. And truth be told, that main pavillion turned out to be the only attraction in the whole premise. Oh well… at least the excitement lasted for quite a while. 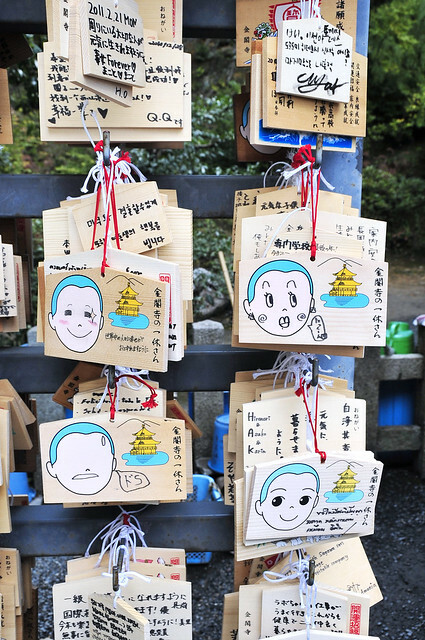 The 絵馬 ema at Kikakuji are cute! We love the one with empty faces for one to splurge on their creativity. 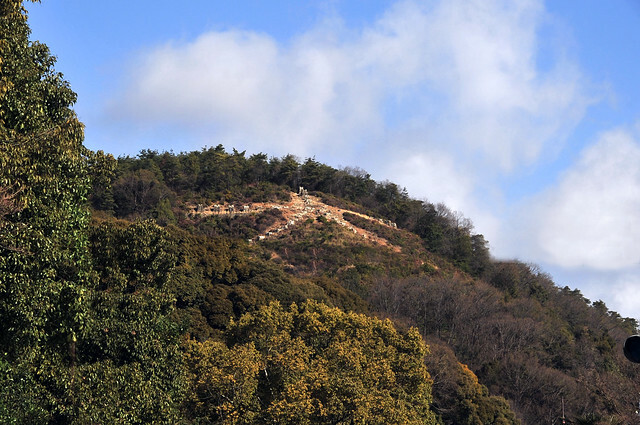 A “Daimonji”, symbolised by a large “大” character, formed from part of the forest cleared out on a nearby mountain,. Bonfires are lit every August during the annual Gozan no Okuribi, during which memorial services for ancestors are held. After an hour at Kinkakuji, we slowly strolled to our second destination, alongwhich we chanced upon a dainty little shop 日栄軒和菓子 that specialises in wagashi, traditional Japanese sweets and snacks and they all looked so beautifully crafted! We just had to pick up a few. 日栄軒和菓子 is a family-run business (mother and son if I recall correctly) that one would not miss as you walk from Kikakuji to 北野天満宫 Kitano Tenmangu. They make an assortment of delectable wagashis and their products change with the season. The items we bought are from the “Spring” theme. Almost too pretty to be eaten. Kire ne…. Shiro’an 白餡 filling was sweet but subtle. not overbearing. Sakura’an 桜餡 would be more apt I guess but this is very good already. 椿, tsubaki. fashioned after the Japanese camellia, one of the flowers which I’d first saw during our Tokyo trip two years back. They are quite a common sight in neighbourhood areas. We chanced upon beautiful shrubs in full bloom in Higashi Ikebukuro near the apartment we stayed and mind you, that was in the middle of winter, when most others were withering away. Its filling is also in the same shiro’an as the yamazakura. 菜の花, nanohana. Fields of rapeseed cultivars in full bloom is probably one of the most beautiful sights to behold of early spring. And this is very elegantly encapsulated in this piece, made using colored shiro-an being pressed through a metal sieve to acheive the shredded texture. 潰し餡, tsubushi’an as filling, basically red beans being mashed up but with their skin membrane intact. 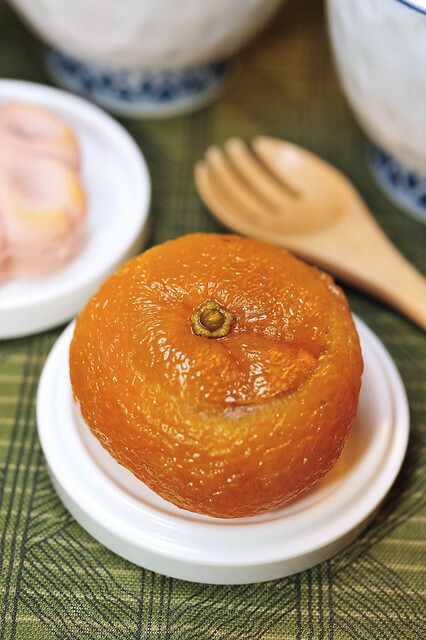 The last piece from 日栄軒和菓子 is a 羊羹 yokan, made from 寒天 kanten. 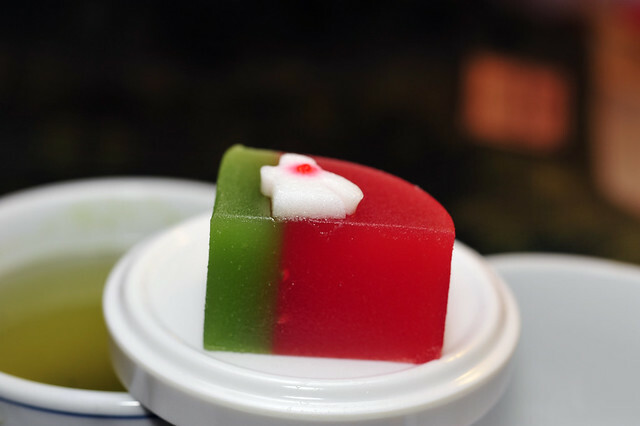 It involves cooking agar in shiro’an dyed in red and green separately. Very sweet! This piece obviously has no filling, but is priced the same as the others. I find yokans generally too sweet for my liking and this piece is no different. Should have gotten something else in retrospect. But then again, I wouldn’t have known if I hadn’t tried. Oh well… Its beautiful though. 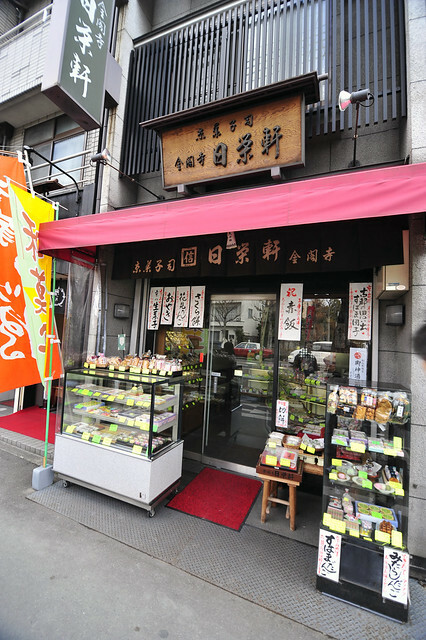 We also bought some wagashi from Daimaru near Kawaramachi the day before but were simply too bloated to have eaten or photograph them then. 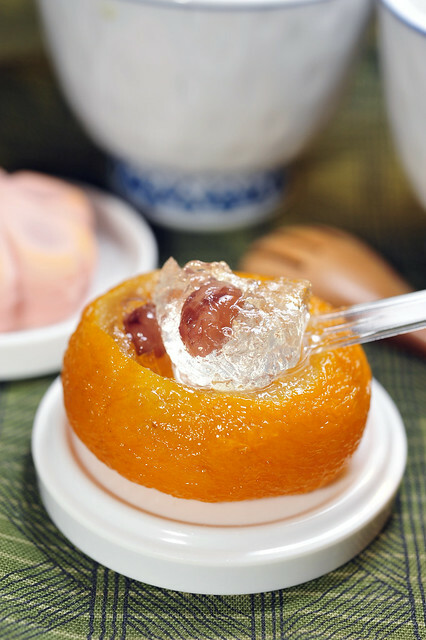 A candied whole yuzu! I was in shock when I was asked the counterstaff about the filling and if the skin could be eaten. “zenbu! zenbu!” was her reply in a rather comical manner, perhaps worried that I couldn’t understand what she was trying to say. From what I understand, the innards of the fruit was completelygorged out along with most of that whitish pulp which would have otherwise been very astringent. 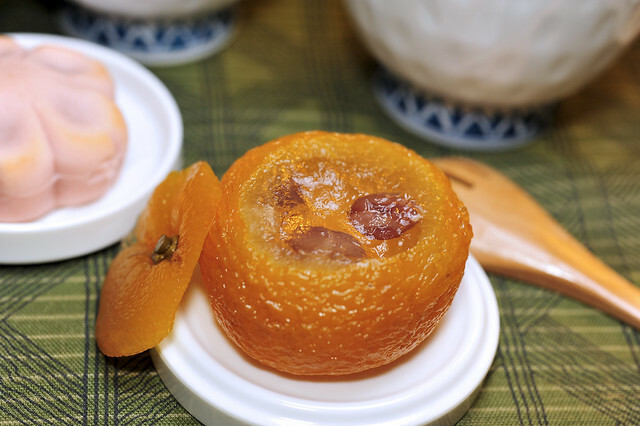 The rind is then carefully poached and then steeped in syrup overnight. They are then filled with kanten and some cooked 金時豆 kidney beans. The agar was very refreshing and citrusy, while the boiled kidney beans are just of the right texture. Its very pricey but definitely worth every penny of it. Yet another type of filling, 漉し餡 koshi’an, made from cooked red beans being pressed through a sieve to remove the skin membrane. This is the typical 红豆沙 we are accustomed to using in chinese steams buns and mooncakes. But what’s intriguing is the intense dark hue it has. And a taste revealed why. The red beans were cooked in brown sugar in place of the usual white sugar. It gave the paste a more full-bodied and caramelised taste, while at the same time making the sweetness less obtrusive as white sugar would probably have made otherwise. We liked it, despite how “un-springlike” it tasted. Overall a really delightful experience with wagashis and 日栄軒’s work is really superb. The pricing is also quite affordable compared to those counters in depachikas, e.g. we saw a 菜の花 piece, albeit more exquisitely crafted, going at more than 1200 Yen a pop. For a wagashi noob like me, this is probably a very good “wagashi 101” introductory class already. 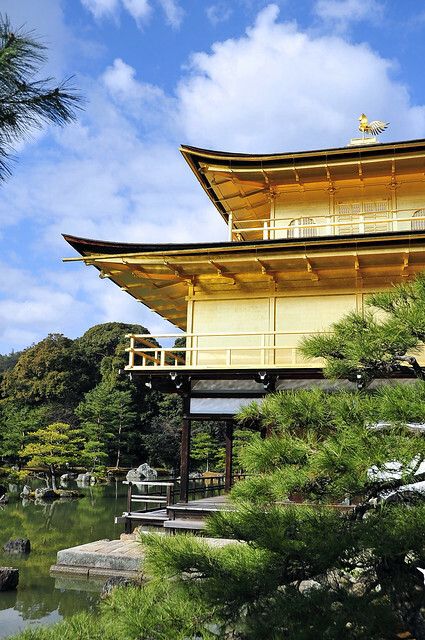 So do pop by 日栄軒 if you happen to visit Kikakuji. I’m pretty sure you would be fascinated like me. This entry was posted on November 14, 2011 by Alan (travellingfoodies). 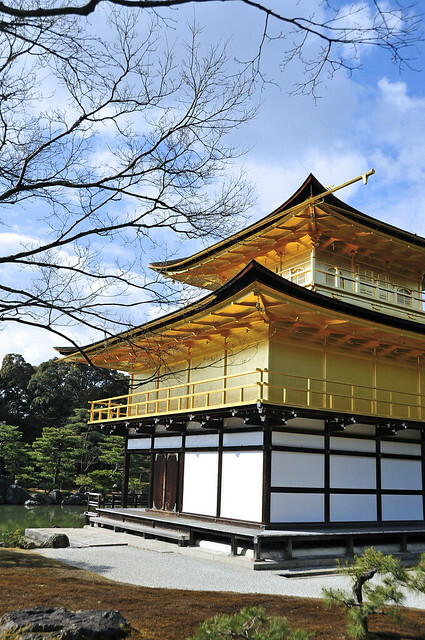 It was filed under Food, Travel and was tagged with 白餡, 金閣寺, 金阁寺, Japan, Kinkakuji, koshian, Kyoto, shiroan, snacks, traditional desserts, Tsubuan, Tsubushian, wagashi, 和菓子, 日荣轩, 日本, 日栄軒, 日榮軒, 京都, 漉し餡, 潰し餡. yeah! almost couldnt bear to eat them! Thanks for enlightening me with these. Hopefully one day I will get to visit Japan. no problem, Edith 🙂 you must visit Japan. its so beautiful!!! Japanese sweets are sweets when drinking Japanese tea rather than a dessert. 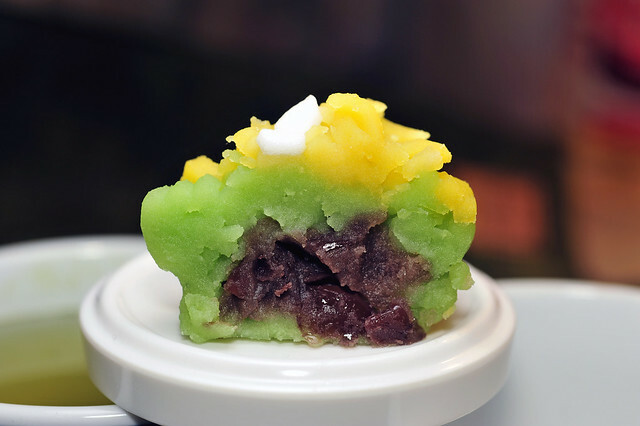 Japanese sweets are eaten together with powdered green tea (bitter), and have become exactly good sweetness. When there is no powdered green tea, the tea made somewhat deep may be sufficient. Balance with the bitterness of tea is considered, and it cuts little by little and eats. Japanese sweets are eaten drinking that of Japanese tea, and I feel the happiness born to Japan in the afternoon which is talking with the friend. Since the custom of drinking Japanese tea has decreased recently, the Japanese sweets which are not so sweet have also increased in number. Since the design is imagining and carrying out the season, it is pleasant for the design which is different when it comes at another season to look at it. 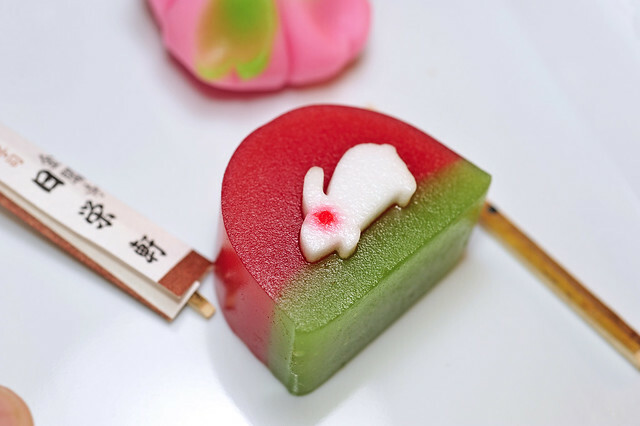 Moreover, please come to Japan and enjoy various Japanese sweets. We had the 和菓子and they were very very tasty! I agree with you that they go very well with Japanese green tea 抹茶. I love the beautiful designs on each piece that represented the spring season. 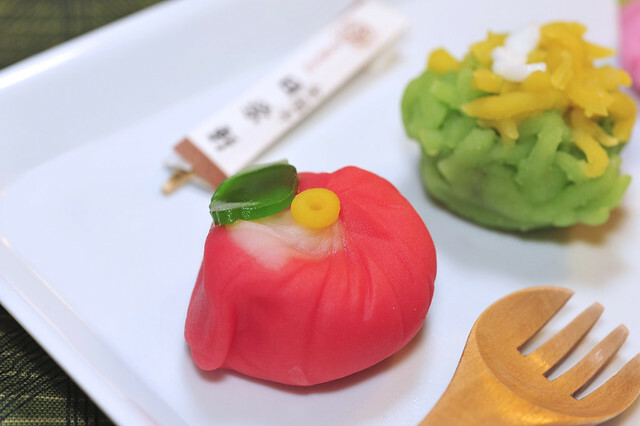 would love to experience wagashi again when I visit Japan during other times of the year. I`m English poor…writing is japanese and google translation. 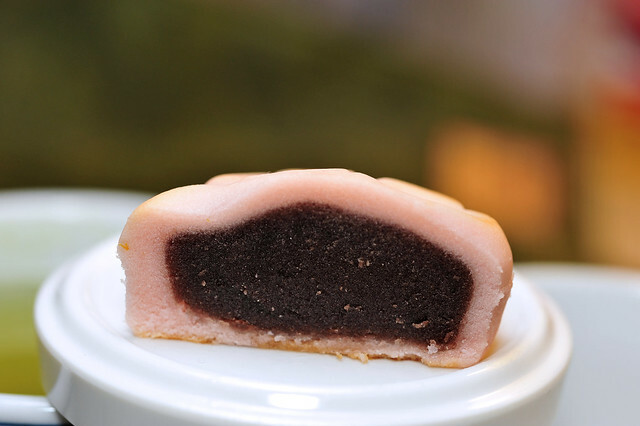 Wagashi is also know as Ocyagashi(teacake). So,please eat with the bitter tea（japanese tea）. 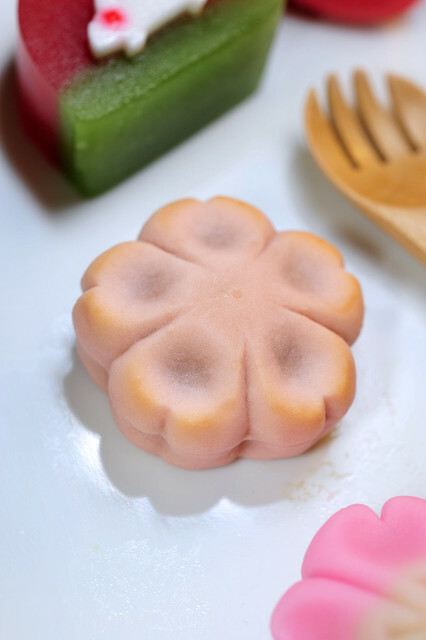 Thank you for your advise on how the wagashi should be enjoyed! I enjoy reading your web. Because sometime it surprised me. 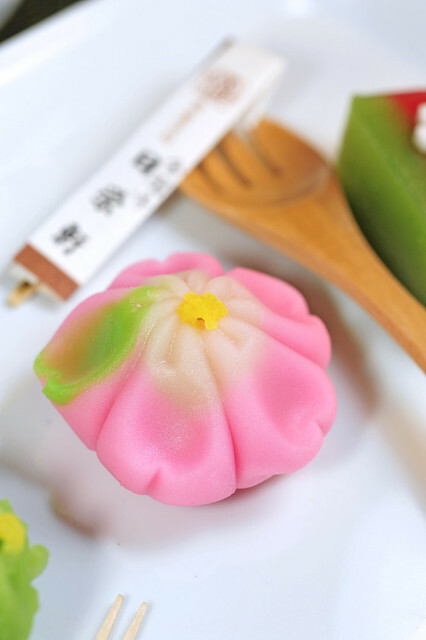 Usaually, Japanese eats wagashi with green tea or Japanese tea because it is so sweet. After drinking Green tea, you feel so bitter in your mouth. and then biting wagashi is to erase the bitter taste. And you feel so sweet in your mouth. So you drink green tea, again. And then, you enjoy harmony of green tea and wagashi. Hi masey! thanks for dropping by! very useful tip that you guys are teaching me here, to have wagashi with japanese green tea. I guess its the balance between bitterness and sweetness from the green tea and wagashi respectively. this balance is something which I’d noticed in other aspects of the food culture as well, especially with the french pastries which I’m more familiar with. The french pastry chefs love to balance the sweetness with bitterness or sourness to ensure that the person who’s eating it doesn’t become overwhelmed by just one sensation. That’s really very logical and yet philosophical at the same time. 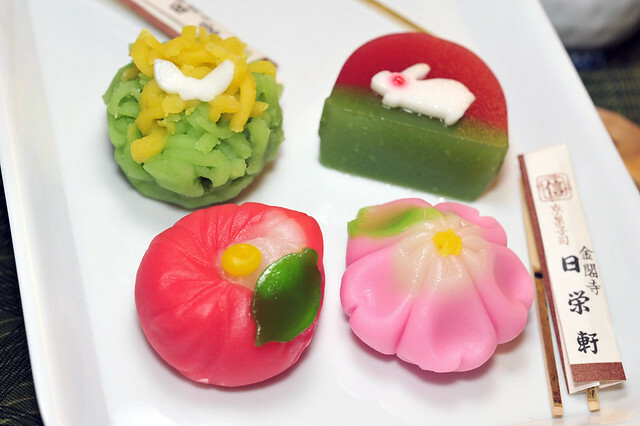 after reading some of the comment up here, now at least i know wagashi is very very sweet and should be taken best with green tea… yay, totally makes sense to me. wish i could try some of these wagashis one day. 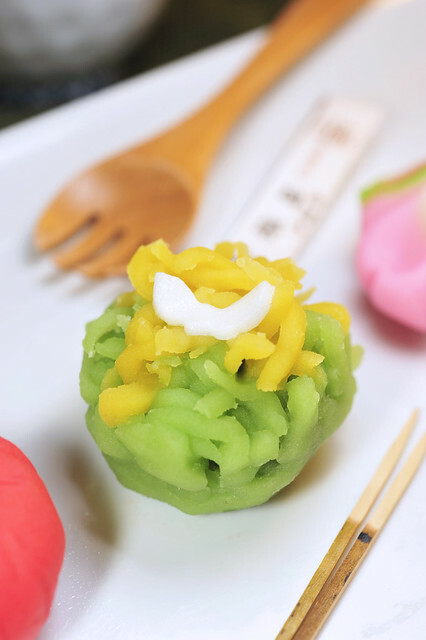 yeah… wagashi is indeed sweeter than most of us are accustomed to eating. Guess the green tea trick works! 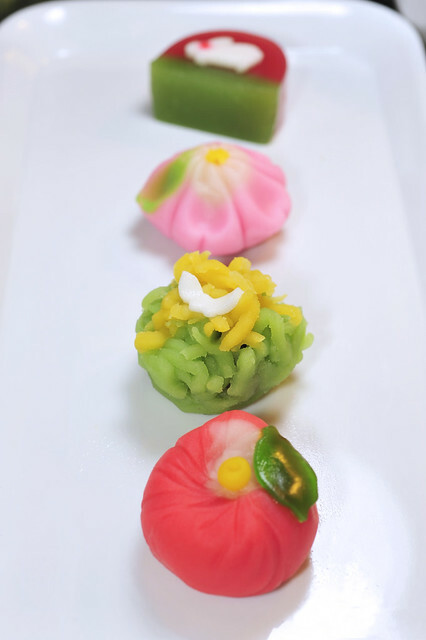 then again, we can always make our own wagashi and then tweet the level of sweetness to our own liking! 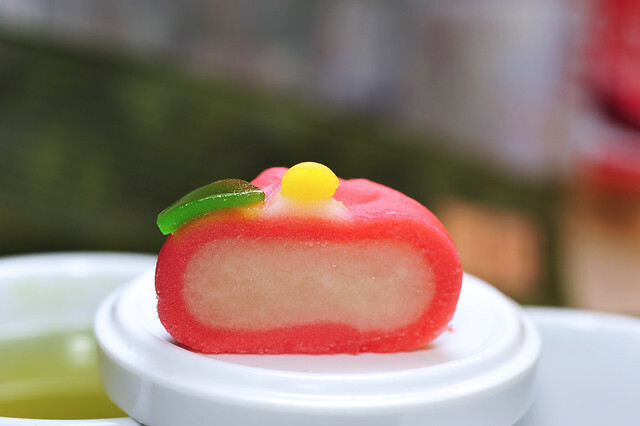 Gosh, I miss Wagashi so much. Originally, I came from Japan (Osaka)and I am in California now. 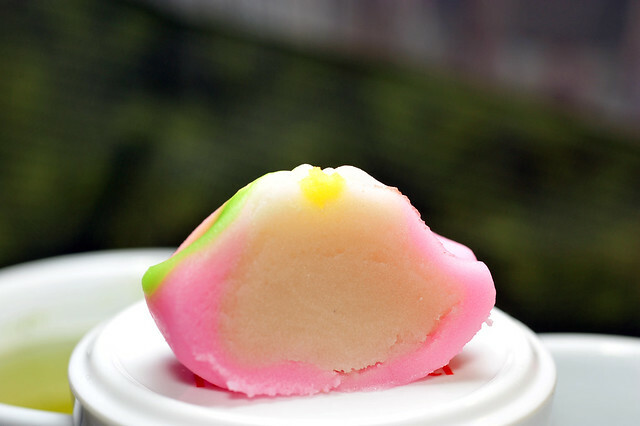 When I went back to Japan for visiting my family, I had to eat Wagashi least once in 2 weeks trip. Sometimes I tried to make them, but it never looks like Wagashi…lol. Thank you for sharing yummy picture and story. I brought back the ingredients to make sakuramochi. hopefully I will get a chance to do it soon! if you know any good websites which I could learn it from, pls let me know.